Fukuoka Prefecture in southern Japan announced on March 3, 2010, the energy saving effects produced during the period from March through September 2009 at 150 households in Fukuoka Hydrogen Town. The annualized reductions were 31 tons in carbon dioxide (CO2) emissions, 130,000 megajoules in primary energy consumption, and 3,551 liters in kerosene consumption. 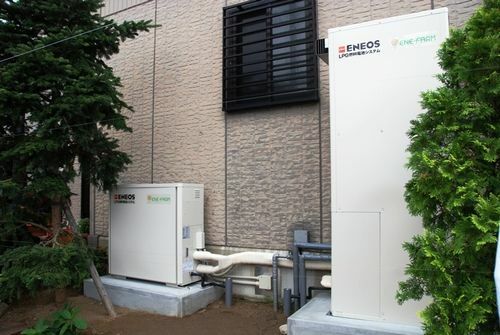 The town is the world's largest hydrogen town, in which the Ene Farm residential fuel cell unit is installed in each of the 150 households in two apartment complexes in Itoshima City, Fukuoka Prefecture (see the JFS article below for details of the project). For each household, on average, the operating time of Ene Farm was 10.3 hours per day, supply rates from Ene Farm for power and hot water were 24.8 and 69.8 percent, respectively; and reductions in CO2 emissions and in primary energy consumption were 14.3 percent and 72.4 megajoules per month, respectively. The household that saved the largest amount of energy reduced CO2 emissions by 145.6 kilograms and primary energy consumption by 1,705 megajoules per month. When compared to the figures for the previous year, fuel and light expenses were cut by 2,260 yen (about U.S.$24.3) per month on average among the 72 households surveyed and by 6,480 yen (about U.S.$69.7) per month among the households that produced the largest effect. The verification test period, which was originally scheduled to be four years, will be extended until fiscal 2016. With the aim of creating a hydrogen energy society, the test will continue after replacing the fuel cell units with newer models that have corrected many of the problems reported in the test to date.